The areas of South Australia worst hit by youth unemployment over the past year have been identified in a new report by anti-poverty group the Brotherhood of St Lawrence. Glenelg is among the suburbs in SA identified as having high levels of youth unemployment. The analysis of Australian Bureau of Statistics data, released this morning, shows the highest proportion of unemployed people between the ages of 15 and 24 live in the Barossa, the Yorke Peninsula and Mid-North regions of South Australia. The region, which includes Port Pirie, Nuriootpa and Peterborough, had an average 15.3 per cent youth unemployment rate between January and December 2018, according to the analysis. 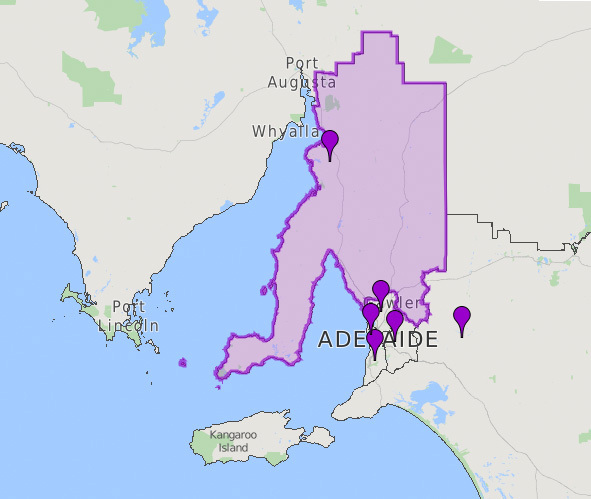 The Barossa – Yorke – Mid-North region, as defined by the ABS (purple area), was the region with the highest youth unemployment rate in the state in 2018, according to the Brotherhood of St Lawrence report. The region with the next-highest youth unemployment rate – 14 per cent – was Adelaide’s south, which includes Glenelg, Hallett Cove, Christies Beach, Morphett Vale and McLaren Vale. “Young people come out of education and training with high hopes and aspirations for independence,” Brotherhood executive director Conny Lennenberg said in a statement this morning. She said the research belied “simplistic” stereotypes about young people. “We know from our research and the experience of our services that many young people are doing it tough,” she said. 15.3 per cent in the Barossa – Yorke – Mid North region, including Port Pirie, Nuriootpa, Peterborough. 14 per cent in the Adelaide – South region, including Glenelg, Hallett Cove, Christies Beach, Morphett Vale, McLaren Vale. 13.7 per cent in the Adelaide – North region, including Elizabeth, Salisbury, Parafield, Gawler. 13.1% in the Adelaide – West region, including Port Adelaide, Fulham, Henley Beach, Plympton. 11.8% in the Adelaide – Central and Hills region, including Nairne, Lobethal, Mount Barker, Birdwood, Mount Torrens.